Men’s Skincare is becoming more prominent and given the number of times men have been caught "borrowing" their wives/girlfriends/sisters skincare products, it seems a natural evolution that they get a skincare range of their own that actually targets their specific needs. Uniquely formulated and features star ingredients Niacinamide, Vitamin Pro B5, Vitamin B3 and Vitamin C and multiple botanical and mineral essences for men’s skin including Ginseng, Green tea, Witch Hazel & Cucumber. Niacinamide helps to increase hydration, improve skin texture, minimize pores and reduce sebum production. Vitamin’s E & C are great oxidants to help skin to resist damage from free radicals, and Vitamin Pro B5 is a proven skin smoother that helps to strengthen skin’s moisture barrier. Big DD, the patriarch of the family and a non-believer of skincare (I had to insist he give these a go) put some of these products to the test and here are his verdict. Not used to putting products around my eye and it felt slightly sticky, it doesn’t smell (has only a light fragrance) and is otherwise a nice gel. The skin around my eyes felt softer after use and maybe it helped with the dark circles but it didn't help much for my puffiness. A very nice product – I like the smell of it and leaves my face soft, not too oily but not too dry either and I feel refreshed afterwards. Smells good like the cleanser, moisturises, quite watery (translation: it's light and fluidy in texture) and not sticky which I like. Keeps my skin soft and smooth. This is like splashing perfumed water on my face after shaving. It is cooling and soothes my skin irritations. It doesn’t sting on areas where I cut myself and makes me feel very refreshed. 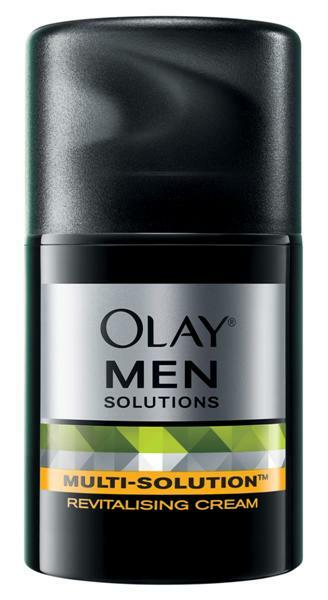 Big DD has high expectations and he gives this range an overall thumbs up with his favourite product being the cream cleanser and the post shave toner. He did mention that he wanted to see more anti-aging results from his skincare range (bear in mind he is hitting the big 6-0 this year). Next time you visit the skincare care aisle of the supermarket or the chemist and you want your guy to look after his skin (or move him away from borrowing your products), why not suggest this range to him? It’s affordable and will keep his skin looking as smooth as a baby’s bum. 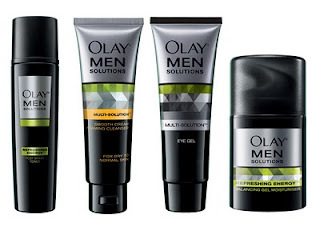 Olay Men Solutions is now available in supermarkets, Priceline and selected pharmacies. Love hearing the male opinion on prodz, so fascinating. Thanks for the heads up on this range, will check it out for my man. Thanks to the makers of Olay for Creating products for that is vital for mens skin care. Much better if you could promote these products by giving samples on your potential target markets mix like Contact Centers, Medical Schools, Corporate Offices where men skin can easily be detected out of work stress. These market will more often buy your product after they have tried and tested the samples given. Hope this will help you generate more profit and to help you create more product innovation in the future.